Located in the Four Corners region of southwestern Colorado in the imposing San Juan mountains, Pagosa Springs is one of Colorado’s hidden gems. Known for its amazing hot springs, endless outdoor activities, abundant sunshine and a small town feel, Pagosa Springs offers something for everyone. This unique western town has the perfect mix of natural beauty, diverse culture and western heritage. Centuries ago, Pagosa Springs was the center of a dispute between the Navajos and the Ute Indians who discovered a mineral-rich hot springs on the banks of the San Juan River. They fought over ownership of the springs while both continued to use them. The Ute finally won control in 1866. The town’s namesake came from the Southern Ute word “Pagosah” which means ‘healing waters”. Coveted for their legendary healing and restorative qualities, visitors can choose between three downtown bathing facilities that offer either indoor or rooftop tubs and pools. In the summer months, the list of outdoor activities is lengthy. Raft, float or kayak down the San Juan River. In May and June, the snow melt provides for the most whitewater action, while late summer offers a calmer float. Hike, bike or horseback ride along peaceful mountain trails to local waterfalls and beautiful vistas. Pagosa is home to Parelli Natural Horsemanship headquarters. Various stables and outfitters exist in the area that can provide horseback riding opportunities. Anglers can find some of the best rainbow fly fishing in secluded lakes, nearby streams and reservoirs. In town, Pagosa Springs is home to a variety of art galleries, live theatre, museums and cultural activities. Surrounded by the 2.5-milion acre San Juan National forest, Pagosa provides endless opportunities for camping and 4x4 adventures. The forest service maintains a detailed facility, trail and OHV map. With fall’s arrival, beautiful colors appear in the foliage as trees turn shades of orange, reds and yellows. The area is a popular destination for hunters, who harvest elk, deer, and other game. In the winter, Wolf Creek Ski Area, a 30-minute drive from town, averages over 450 inches of snow each year thus claiming the most snowfall in Colorado. This family-run and friendly ski resort with 1600 acres of varied terrain is known for powder snow, short lift lines and affordable family fun. . Reduced-priced tickets are available for Local Appreciation Days (no ID required). Snowmobiling, cross-country skiing and snowshoeing are other popular winter activities. 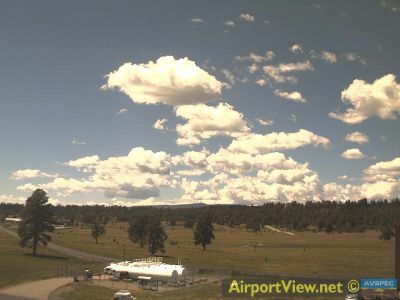 Pagosa Springs is the perfect gateway to explore scenic areas and sites of interest such as Chimney Rock Archaeological Area, Navajo State Park and the eastern Weminuche wilderness area. For golfers, there is also a championship 27-hole golf course. Families can also enjoy disc golf and miniature / putt-putt golf. The area offers hotel, resort, and dining options for all tastes and budgets. This out-of-the-way Colorado town, about 275 miles southwest of Denver and 25 miles north of the New Mexico border, awaits your next outdoor adventure or relaxing getaway. Tie-downs provided: Yes, In the winter tie downs are removed for plowing. around Stevens Field most sensitive noise area directly south of runway 19. 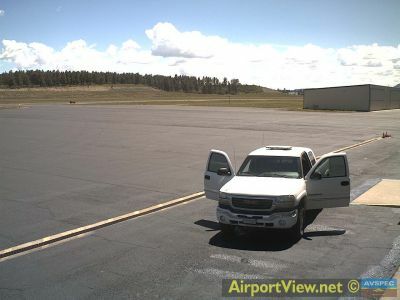 Camera pointed Northeast towards Wolf Creek Pass across the runway. 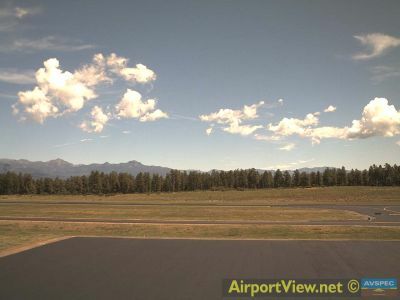 Current View of Pagosa Peak and north range of San Juan Mountains. Camera points north. 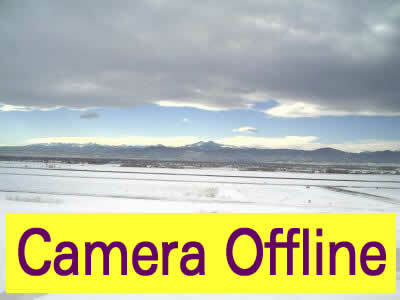 Camera pointed East towards Alamosa. 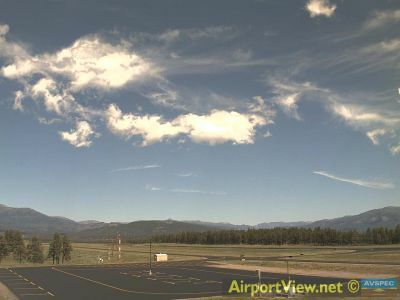 Camera pointed West towards Durango, CO.
View of the Main FBO Ramp. Camera pointed Southeast.